After spending a week in sunny Long Beach, CA for a conference (you know I just said that to make you all jealous), here is instalment number two of the Christmas knitting! 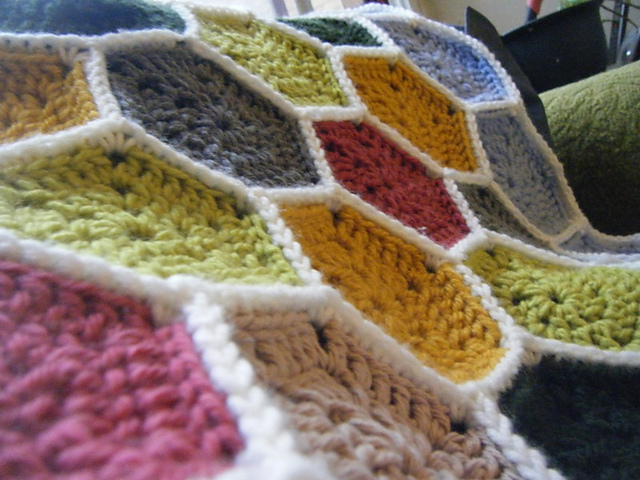 It was actually a lot of crochet too, you know, to be fair to the craft which inspired this blog's title. This little blanket, which is approximately 3 feet in diameter (I didn't actually measure), only took me a week to crochet. 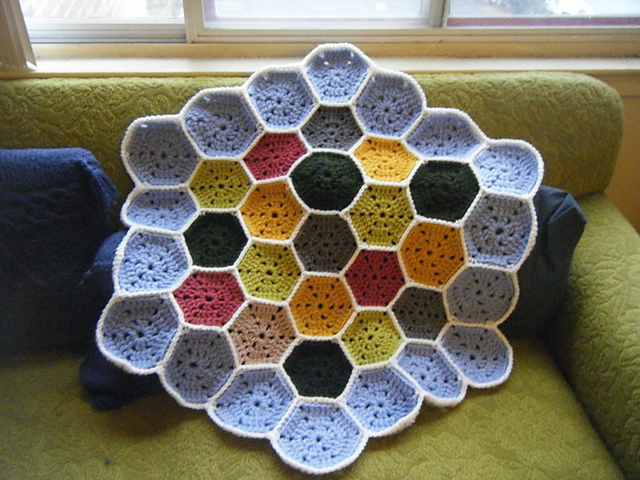 I thought I'd get super bored of the repetitive hexagon pattern, but it was actually kind of addictive. I'd be willing to entertain the idea of doing a grown-up sized version in the future, potentially as a stash-buster. I would love to tell you that I used up a significant portion of my stash crocheting this, but I would be lying if I did. The red, light green, grey, and tan hexes were made from yarns I already owned, but I ended up buying some big balls of Mary Maxim yarn for the rest of it. Bulky acrylic is all I remember... nothing noteworthy. Ch 6 and join into a loop. Rnd 1: Ch3, dc into loop, [ch2, 2 dc into loop]x5, ch2 and sl st to join to top of first ch3. Rnd 2: Ch 3, dc into next dc (from previous round), [dc into ch2 loop, ch2, dc into ch2 loop, 2 dc into next 2 dc, dc in next ch2 loop]x5, ch2, dc into final ch2 loop, sl st to join to ch 3. Rnd 3: Ch 3, 2 dc into next 2 dc (from previous round), [dc into ch2 loop, ch2, dc into ch2 loop, 4 dc into next 4 dc, dc in next ch2 loop]x5, ch2, dc into final ch2 loop, dc into next dc, sl st to join to ch 3. Next up we have a ridiculous sheep hat created for a toddler that ended up way too big. I used the pattern Yip-Yip by Lesley Brownlee, only instead of the intarsia arrow, I opted for a sewn-on felt one (mostly because I didn't have the right colour yarn on hand). It's a pretty cool pattern, but I think if I were to do it again, I'd change the crown decreases because they were a little abrupt. Also, the toque doesn't quite cover my friend's ears. He's nice enough to wear it anyway.